With more than 5 million full-time jobs being created every year in the arts and culture industry, pursuing an art major is far from committing economic suicide. Individuals who possess the skills gained from an art degree are often able to demand top salaries and working conditions that would make the average office hermit green with envy. Unfortunately, college tuition is getting more expensive with each passing year. Thanks to the generosity of art patrons and associations around the country, though, getting that art degree doesn’t have to put a strain on your bank account. Below are 25 great scholarships for art majors. Named in honor of Archibald Rutledge, South Carolina’s very first poet laureate, the Archibald Rutledge Scholarship Competition is an annual competition that offers 12th grade students enrolled in a South Carolina public school the opportunity to win a scholarship in dance, creative writing, visual arts, music, or theatre. Students must submit original compositions, required documentation in one of the five arts disciplines, and process portfolios. Students may submit their entry via mail or in person to the South Carolina Department of Education. Five scholarships will be awarded, each for the amount of $2,000, in May of 2014. Established by the Art Institutes, the artinstitutes.edu Merit Award is available to students who display evidence of merit and motivation to complete the program but who are unable to afford the cost of the program. Students wishing to apply for the scholarship must have a minimum cumulative GPA of 2.5 or have a minimum GED score of 50 on all three sections of the GED exam. This is a need-based scholarship so the student must demonstrate financial need by completing the financial aid forms and accept all types of aid provided, including federal student loans and grants offered through FASFA. The Arts Academy is an international higher education institution with many locations throughout the United States and abroad. 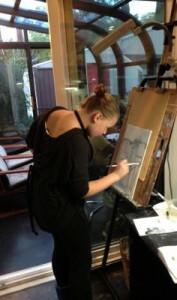 To contact an Arts Academy location near you, visit their website at http://new.artinstitutes.edu/ and choose a location. Established specifically for the purchase of books, the Cay Drachnik Minorities Fund for the Purchase of Books offers a maximum $900 award to student members of the American Art Therapy Association who are enrolled in an AATA-approved art therapy program. Students interested in applying must demonstrate financial need and include an essay along with the application packet. Non-AATA members may submit an application for membership in a separate envelope at the same time they submit the scholarship application. Award amount varies. Students enrolling in the Cornish College of the Arts may receive an institutional and a department scholarship during their first year of attendance. Students receive guidelines and an application deadline for their respective departments. Applicants who have distinguished themselves by receiving an endowed award have the best chance of receiving a scholarship. Deadline: Varies by school zip code; click here and enter your school zip code under “What Are My Deadlines” for more information. The Scholastic Art & Writing Awards is one of the longest-running and prestigious competition offering creative teenagers scholarships in the United States. It also happens to be the largest source of art-related scholarships in the country. The contest is open to all students grade 7 through 12 enrolled in any public, private, or home school in the nation. Contest winners receive a $10,000 scholarship and automatically become eligible for scholarships offered by more than 60 art institutes, universities, and colleges that earmark more than $5 million dollars in financial aid. Sponsored through WorldStudio, an innovative strategy and communications firm located in New York City, the Daring Young Artists to Dream Scholarship offers financial aid to students from minority and economically disadvantaged backgrounds so that they can pursue their dreams to attend a college or university as an art major. The scholarships are funded through the generosity of individuals, corporations, and non-profit organizations. Google has been hosting the Doodle 4 Google competition since 2008 and received more than 114,000 submissions during last year’s contest. Students grades K through 12 are eligible to enter as long as they are enrolled in a US school, reside in the US, and are a US citizen or be able to prove permanent US residence (via a green card, for example). The doodles are judged by a panel of Google employees as well as guest judges including well-known journalists, authors, cartoonists, athletes, and illustrators. In partnership with the Scholarship Art and Writing Awards, Duck Tape offers an opportunity for one student to receive a $500 cash award for producing a work of art incorporating Duck Tape brand duct tape as part of the original work. The 2013 Duck Tape Brand Award winner was Laurel Taylor, 15, of Cincinnati. Furman University of Art departmental scholarships are available to freshman students wishing to actively participate in the art department as either majors or non-majors. Scholarships vary in size from smaller $1,000 and $2,000 scholarships to $14,000 maximum award scholarships. Students do not need to demonstrate financial need but must demonstrate continued performance, dedication to achieving excellence, and diligence in his or her work. Applications are reviewed in early spring of each year. The Handweavers Guild of America offers a number of scholarships to individuals interested in studying at a formal institution of higher learning or attending workshops. Grants available to HGA members include the Silvio and Eugenia Petrini Grant, the Mearl K. Gable II Memorial Grant, and the HGA Teach-It-Forward Grant. The latter is available to individuals who do an outstanding job of teaching weaving or spinning and getting new people interested in the craft. Awards vary by grant and by individual. Hope College’s Distinguished Artist Awards provide up to 60 students each year with $2,500 to be used toward college expenses. Students with strong academic records and genuine talent in art, creative writing, theatre, and music must follow the submission guidelines laid out here. This scholarship is renewable up to four years. Applicants must maintain a minimum cumulative GPA of 2.6 and must enroll in at least one related course each semester. Established by L. Ron Hubbard, the L. Ron Hubbard Illustrators of the Future Contest has been offering individuals the opportunity to get published and win cash prizes every year since 1988. Contestants who have been professionally published will be disqualified. The top prize is $5,000. To win the top prize, a submission must win each of the quarterly contests. The winner of the grand prize will be announced at the L. Ron Hubbard Awards Event held in the year that the submission wins. Funded by the Illinois state chapter of the Delta Kappa Gamma Society International, the M. Josephine O’Neil Arts Award offers Illinois residents who are current students in their second or third year at an accredited college or university the opportunity to receive a grant to further their education. Award amounts vary but the total of all awards granted is capped at $6,000. Applicant must be female to qualify for this award. Student must demonstrate exceptional achievement as a visual artist or performing artist or in music. Sponsored by the Memphis College of Art, the Memphis College of Art Portfolio Award offers qualifying students up to $15,000 toward an education in art. Individuals interested in pursuing the Memphis College of Art Portfolio Award must submit a portfolio, ACT or SAT scores, and high school transcripts. The award is granted each year and is renewable if the student maintains a minimum GPA of 2.0 as a freshman, 2.25 as a sophomore, 2.5 as a junior, and 2.75 as a senior. This award covers approximately half of the cost of tuition at Memphis College of Art. The average award amount is $7,000. The Minnesota State University Moorhead offers incoming freshman talent scholarships to help pay for the cost of their education. Students interested in applying for the scholarship must be an Art & Design major. This scholarship is renewable for up to four years if the student maintains satisfactory academic progress. Applicants must submit four original works in basic drawing and design. Award amounts vary. The National Sculpture Society hosts an annual national sculpture competition with a grand prize of $5,000 and smaller prizes ranging from $350 to $1500. The competition is sponsored by Brookgreen Gardens, New York Academy of Art, the National Sculpture Society, and the Lyme Academy College of Fine Arts. There are two parts to the contest, each offering a grand prize of $5,000. The first part requires the applicant to successfully model a full-length figure over the course of 28 hours. The second part is for the best sculpture in bas-relief. Sponsored by the North American International Auto Show, the NAIAS High School Poster contest offers qualifying high school students the opportunity to gain exposure with their artwork and win a scholarship ranging in size from $1,000 to $100. Contest winners are announced prior the North American International Auto Show, which is held between January 19th and January 27th. To enter, contestant must be a Michigan high school student in 10th, 11th, or 12th grade. The maximum number of posters each contestant can enter is two. Posters must have an automotive theme to be considered. All posters must include the following words and phrases: “North American International Show”, “Detroit”, and “Cobo Center”. Each year, the Print and Graphics Scholarship Foundation provides scholarships to more than 200 high school seniors or graduates that are pursuing a career in graphic communications, printing management, printing technology, or publishing. The student must be enrolled, or plan to enroll, full-time at an accredited two or four year technical school, college, or university and be able to maintain a minimum GPA of 3.0 or higher. Scholarships are granted to students with high school or college transcripts that demonstrate academic success and indicate that the student will complete their course of study. The application is only available from November 1st to April 1st. The average scholarship awarded is $2,000, though some students receive as much as $5,000. These scholarships are renewable. Awarded by the American Art Therapy Association, the Rawley Silver Award for Excellence is a cash research grant between $750 and $1,000. Only voting members of the AATA can apply and each member is only allowed to submit one proposal. Applicants must submit one “blind” copy of the proposal, one proposal with the author’s name, and the grant application. The Savannah College of Art & Design (SCAD) offers a number of scholarships to help students meet the cost of tuition while attending Savannah College of Art & Design full-time. Some SCAD scholarships, such as the May and Paul Poetter Scholarship, cover the full cost of tuition, while others grant anywhere from $1,500 to $12,000 in financial aid. All SCAD scholarships require the student to demonstrate exceptional academic or artistic achievement. Proof of financial need is generally required. Funded by a trust created by Marion Barr Stanfield for Unitarian Universalists studying the fields of art and law, the Standfield and D’Orlando Art Scholarships offers financial aid to individuals that are active participants of Unitarian Universalism, demonstrate financial need, and are enrolled at an accredited institution. Students wishing to receive financial aid every year while enrolled in college or university must submit a new application each year. Students who are granted the scholarship are notified in May for the academic year beginning the following September. Students who apply for the Stanfield Art Scholarship are considered for the D’Orlando scholarship automatically. Eligibility criteria are the same for both scholarships. Establish in memory of Phyllis Craig, a founding member of Women in Animation (WIA), the Phyllis Craig Scholarship provides $1,000 to one deserving student in addition to a free one-year membership to WIA. In order to qualify to submit an application, a student must demonstrate exceptional artistic talent and a passion for animation. This is a non-renewable scholarship. One student is awarded the scholarship each year. Each year, the Union League Civic & Arts Foundation awards five $5,000 grants. Applicants must be between the ages of 18 and 30, be enrolled in or be a graduate of an accredited degree program, and live within 150 miles of the Union League Club of Chicago. 5 images of artwork must be submitted with the application, as well as an artist statement. Images cannot be larger than 72 inches in any dimension. This two-year, $20,000 scholarship is available to individuals that have a financial need, are a graduating senior or have graduated from a Washington state public high school, demonstrate artistic talent in the visual arts, have been accepted into the art program of an accredited college or university, and maintain a GPA of no less than 3.0. The Wendy Jackson Hall Memorial Scholarship was established to honor the memory of Wendy Jackson Hall. High school students interested in applying for this variable award scholarship must submit a piece of patriotic art on paper or canvas to the state chapter of the Ladies Auxiliary before advancing to the national level. Artwork must have been completed during the current school year and must be signed by a teacher. The maximum award amount at the national level is $10,000. The minimum award amount on the national level is $500. The above list of 25 scholarships for art majors is not meant to be a complete list of scholarships available to art major; other scholarship opportunities are available.